I hope the addresses of the ones that used the Susan Lander propaganda tool are exposed before election day. I’ve been told it was Ronda O, BarbaraF, KatieF, Les and Jerry signing on as Susan. Wish I knew for sure I could use 10k for Easter. My car is broke, my rent is late and my hours just got cut. I can understand why The Blind Tiger owner might be upset by this. But, exactly what criminal statute could someone be charged with for doing this? Stolen identity? Whose stolen identity? Fraud? Who was defrauded? And, what prosecutor could you find who would actually charge if it did fit under a statute? 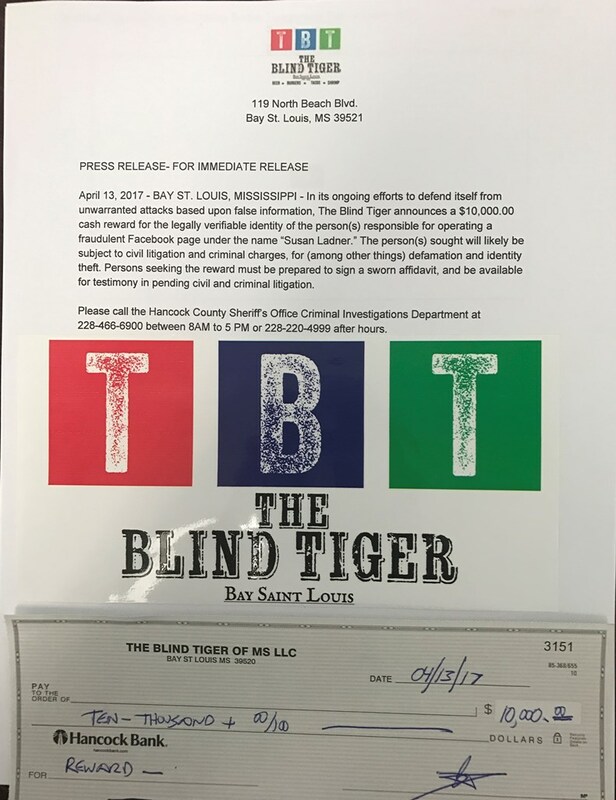 Obviously not the ones who have been assigned to the Bay Saint Louis corruption investigation. From what I am hearing, the woman who reported to her local Police Dept. that her picture was used with the name that was not hers, is from south Louisiana. This is way above my pay grade, but that could be the identity theft, I would think. What charges could be brought for that? Don’t know. Was she the defrauded one? Don’t know how the law reads on that either? Hindsight is always 20-20, but I would suggest obeying parking and all driving regulations. And, even though Thomas and Amy came under a little criticism ( I did not see their posts) for their remarks, at least they identified themselves and did not express their anger under another person’s name or face. PS: It cannot go without notice that all of a sudden Susan Ladner disappeared as soon as her bluff was called! And let’s not be calling for a boycott of any local businesses. Our little area needs every sales tax dollar it can get especially this time of year, when ad valorem is almost at a stand still. Having to park in a different place ( and several downtown businesses have parking places marked for their customers) really doesn’t affect someone’s life like having your and your business ess’s name smeared. Thomas was smart enough to bring it to Hancock Sheriff office. They are already working the malfeasance in city hall case. It would take a fool to bring it to the corrupt bay pd and the lapdog cheif. Don’t have access to all of that info, but I can understand the woman in La. wanting her name cleared. The reward is not so high nothing. And identity theft across state lines is serious. Les and Jerry just man up for once. not just saying she was going to boycott his business, but soliciting others to do so which invited all kinds of other negative remarks about him?! He goes after her. After all State Police in La. should be able to find her easily enough if she holds a valid DL. Now she not only has someone illegally using her picture under another name, she has a business owner going after her?! All because people with high recognition of an old family name decided to use property that did not belong to them. Go downtown and make a list of all of the businesses that are provided X number of parking places with their leases, and have them marked accordingly. If I decide one day to behave like a 2 year old, I would rather be Booted than towed. The Business owner may use a towing company from Biloxi or Picayune where I will have to take my 2 year old self to get my car when I could just pay for the Boot to be removed, and drive off right then! The absence of boundaries in our lives can sometimes make us think we have rights we don’t actually possess. Les will have to pay off someone to keep it quite. He should have the money from the medical waste company. Was told the rewards doubling to 20k if it happens within 10 days. To expose whoever before the election. The drama never stops in this town, does it? And unnecessary drama, Observer. Here we are in 2017 in a small town, civilized society, and people cannot understand a business owner trying to maintain parking places for their clientele. Why is it even necessary to state a penalty for violating the request to not park in a private parking place? Why wouldn’t it be enough to just post a sign that says for “this business’s customer parking.” PERIOD. That should be enough for the average, well intentioned citizen to understand that parking place is not for them unless they are entering that building to do business. This is not complicated or dramatic, but unfortunately those who know no boundaries for themselves have made it so. And, the business owner who is paying the lease gets the bad name. Go figure. Why does Pass Christian seem so normal compared to over here? Is it chemicals in our water supply or something? But, I will say this. It is always entertaining! Pass Christian has Chipper, we have Less. He has done such a great job he does not have any opposition in his re-election. Pass also has Weak Mayor home rule. The office has not changed Chipper which is rare. He does a great job for the Pass. Not to mention, they don’t seem to love drama the way the Bay does. We seem to need it. The Louisiana influence maybe. I only hope and pray that the questions get answered before election day. How petty and pathetic of the mayor and his team to hide behind a fictitious Facebook account. Its a sad day when he doesn’t have the gumption to address these concerns publicly as a man of honor. Instead, smoke and mirrors, smoke and mirros. I’ve been told the owner of the big Alcan building on central ave passed away and Les suggested that location to the medical waste group. I wasnt present but was told from someone that was at the solid waste meeting. He said it would be very easy to get rail access again. Is he nuts? Hauling infectious waste from several states here. What about the leftover product, what about a derailment, a truck accident, contaminants could spread every where. It’s too close to the water and population. Why not in the NASA buffer zone? Why from other states? That needs to be investigated. Big money can’t control everything. I understand there was a hearing on this issue. Did anyone posting here attend? They’re sustainable technologies on the market for the treatment of medical waste that are cost effective, safe, and pose little to no threat to the general public. But I digress. Seriously doubt this sort of thing is even being considered in Hancock County because there isn’t as much money to be made “on the back end” with the newer technology as there is if they stick to the old school methods of medical waste disposal. I think it is all part of the big plan. I would like to think that the same politicians who have a tendency to screw things up for everyone would not have the foresight to make strategic moves with our transportation infrastructure; BUT, when it comes to personal profit, the ability to make things happen seems to have an exponential gain! Railroading in medical waste—yes, along with lots of other things that the people of Mississippi will never know about. Stage 1 complete……immediate exit of the new Port and Harbor Commissioner. Job well done! The best way to transport this waste is by barge and railway; minimizing the potential exposure to the public by not using roadways. Soon, there will be a hub built that will allow “things” to pass freely into Hancock County by rail; which runs both ways! Did the mayor have the foresight to get invested???? Who knows, but, IN MY OPINION, there will be a lot more things entering our state than we will ever know about. This would be great news for my company; currently working at one of those Post WWII waste sites in Washington, but, here’s my problem: 1. My company will never get any of those contracts, because I am pretty sure they are already promised to others 2. I am a Mississippian first; always, so, I don’t want to see this stuff being buried anywhere close to my home. I can assure you that it is NOT, simply, “harmless radioactive waste.” We are talking about the leftovers from making the device that leveled Hiroshima and Nagasaki…harmless right. So, what’s a little medical waste compared to that; besides a bonus check! the Mayor of Bay St. Louis is rumored to be courting to dump their medical waste in town is “Trash Doctors, LLC!!!!!!! How did that even get on the agenda of the Solid Waste Authority? Is the BSL Mayor still Chairman of that Commission??!! Yes Lucifer is still chairman of the solid waste. As we know employees are driving Lucifer around during business ours knocking on doors & putting signs out. Anyway hope someone looks into this. Fact–File a complaint with the SOS Office and AG Office. county Sheriff’s Dept. and they are proceeding g with a criminal investigation for identity theft. Susan is, but “she” left some good clues herself on Facebook. lectured one person on Facebook about his Catholic faith. So now it is up to the Sheriff and his staff of investigators to call in the right people to expnorate the Baton Rouge Susan. Personally, I hope “she” is caught to discourage others from doing the same thing to unsuspecting people!! Will it be more or less serious than the city corruption investigation? Only time will tell that! Well that one sure didn’t go anywhere fast. Maybe they will put the A team on this one. Corrupt city government is one thing, but Facebook and parking spaces, that’s a whole ‘nother level of crime. Wendy and Les were absent again last night at the city council meeting. We pay them to work, if they can’t attend the meeting they should step down. They are committing fraud when they cash the cities payroll check. How about the person who asked Wendy for a stop sign in Ward 2. Wendy did not care enough to even up. Yep she still gets paid! Has anyone noticed that Rachael Ramsey posted ‘You’re quite real. I will attest’ to a statement made by the mysterious Susan Ladner that some people thought she was a fake. Mrs. Ramsey, who is she? There is $10K at the end of the question if answered honestly.